…when you’re having fun, right?!? And we have been having fun here at the aLearning Blog! Suddenly, it seems, we’re publishing our 250th post and celebrating five years. Yep, five years. And so much has changed! A lot has changed over just five changes of the seasons, hasn’t it?!? To celebrate this milestone, we’ve compiled an ebook of our Top 100 aLearning Blog Posts. Just skimming through these selections made us realize how quickly the elearning sands shift, affecting the landscape, even moving the horizon. At over 200 pages, this compilation brings together in one place the best — and most controversial — writing from the aLearning Blog. We’ve included most comments (the fine print is that we’ve deleted pingpacks, backtracks, and outright sales pitches) and are proud of the attention the aLearning Blog has garnered over the years by elearning and education experts. We’ve made this e-publication very affordable at just $5. To order, go to www.ellenbooks.com/store.html and click the “Buy Now” PayPal button. You should be able to read this PDF from any device with a PDF reader (such as Adobe Reader). If you’ve purchased aLearning: A Trail Guide to Association eLearning, we’ll send you a copy of the Top 100 Posts for free. Just send Ellen an e-mail at ellenbehr@aol.com and attach an electronic copy of your Lulu receipt, and we’ll send you the Top 100 Posts by return e-mail. We appreciate your support and are happy to say “thank you” in this small way. Meanwhile, we’ll make it up to you by providing this edition of Quick Clicks, some links to what we believe are valuable resources, articles, and tools, collected here to help save you the time of tracking them all down. As always, if you have suggestions for Quick Clicks links, send an e-mail. Curious about MOOCs (Mass Open Online Courses)? Wonder what the impetus was for the first one in 2008 (yes, they’ve been around more than three years now)? Want to see how Connectivism is at the center of it all? Read all about it at Stephen Downes’ “Creating the Connectivist Course” at his Half and Hour blog. Still looking for justifying elearning? Looking for support in your argument that online teaching and learning has been validated? Craig Weiss at the E-Learning 24/7 Blog has captured a bunch of facts with bona fide, respectable sources in hispost, “Online Learning in Education.” The post focuses on elearning in higher ed, but hey, if you can get a legitimate university degree this way, shouldn’t it be fine for our association members?!?? 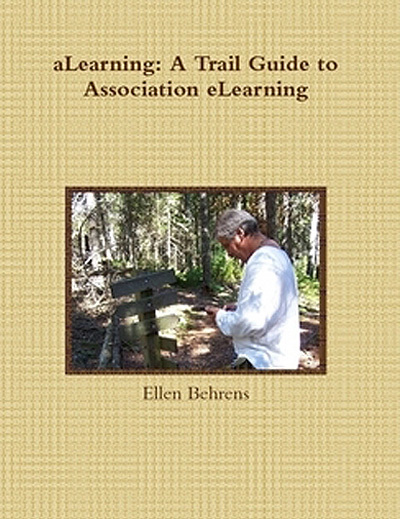 Of course, we believe you should start with aLearning: A Trail Guide to Association eLearning when developing a strategy for your learning programs (especially online offerings)… but you would also benefit from Marc Rosenberg’s “Ten Common Mistakes in Building an eLearning Strategy” from his Marc My Words blog. It’s a quick but very valuable read, and you don’t need to be an eLearning Guild member to access it online. Yes, we’re still fighting the “learning styles” myth. Here’s more ammo from Knowledge Factor’s blog. We all like stuff that’s free, especially when it saves us money and performs a job for us. You can thank Tom Kuhlman at The Rapid E-Learning Blog for a list of five free image editors. Manipulate those clip art images, photos, and other graphics to make your tutorials, newsletters and other documents look the way you want, instead of the way those images are handed to you. Read his post for the full list and links to those editors. If you’re looking for ways to make your Webinars less passive for your learners, take a look at Christy Tucker’s “Synchronous Software Scavenger Hunt” post at her blog. Christy’s been exploring how to make Webinars more active for quite a while, and the brief case study in this post will get you thinking about some possibilities. For example, if you’re implementing a new LMS in your association, why not offer a Webinar that gets your members to hunt for various features or options? Wouldn’t that be far better than just doing a boring show-and-tell of the features?!? What other ways could you leverage a “hunting” activity during a Webinar? I appreciate Christy including a reference to aLearning and links to my earlier posts about Webinars and information-driven sessions. It’s great to get nudged (okay, pushed) into imagining how we can leverage the technology of live Web sessions for things other than talking heads. Thanks, Christy, for a great post! And the update comes from Craig Weiss, who’s made his very useful (and FREE) LMS/Learning Portal Directory even better. It now includes whether the vendor provides a demo, pricing (if so, there’s a direct link to that info — Craig also believes that pricing shouldn’t be a deep, dark secret when so much moola is at stake), indicators for products with new features, and link updates. This is a tremendous service — and Craig has made it even better by starting a LinkedIn group that covers more detail than his blog, which gets into things like personnel and other business changes at LMS companies. These are important details to keep an eye on — who wants to make a major purchase from a company that always seems to be in some sort of internal upheaval? Of course, who has time to track all that?!? So leave it to Craig — whose business it is to do that — and reap the benefits of his insight. Do Shared Recommendations Lead to Learning? Looking for more instructional design and elearning blogs to follow? Christy Tucker’s list at “Experiencing E-Learning” will keep you busy for awhile. At Karl M. Kapp’s Kapp Notes blog see “Formal Learning All the Way, Baby…” and the comments for an excellent post and discussion about the value of formal “courses” and the role informal learning can play with it. Is it a speech, presentation, or something else? A tussle revolving around the notion of speeches, orations, presentations, discussions, and what audiences want and expect waged briefly between David Murray at Vital Speeches of the Day (see the post and comments here) and Olivia Mitchell at Speaking About Presenting, whose original post about what she calls the “third era in presenting” started the ball rolling. Looking for an easy to read and follow summary of the various types of educational simulations? Karl Kapp’s Kapp Notes post, “Different Types of Educational Simulations,” is just what you need. Is This Post Relevant to You? Of Course It Is! TMA Resources is in the midst of conducting a series of three Webinars on a topic they’re calling “Beyond Relevance.” Their associated blog includes posts from panelists and presenters on the topic — all advocating that the notion of relevancy be laid to rest in favor of innovation. Huh? Relevancy is now passe? I can’t be reading that correctly! relevancy to the students. Don’t start with Poe. Start with King and move back to Poe. Start with what the students know and connect to. Then walk them back along the branches and down the trunk to the roots of what they already love. I taught grammar the same way. A college composition student was struggling with parallel sentences. I found out he was a math student. “A parallel sentence is the same thing as a mathematical formula — both sides of the equal sign have to be the same,” I told him. “Think of the word ‘and’ or ‘or’ in the sentence as the equal sign. Then make the verbs on either side of it match in their form. If the verb should end in ‘-ing’ then they all should end that way.” His face lit up — he got it. He didn’t need all the fancy-shmancy grammar lingo and explanation, he just needed a practical way to remember how to make those sentences. Finding what was relevant to him and using that helped him begin to understand rules of grammar that had always mystified him. Obviously, if we’re choosing sides here, I’m a “relevancy” supporter. I disagree. Something is relevant to me or it isn’t, in the here and now. Saying something is relevant is saying it matters to me. It’s important. It relates to me in some way. I’m connected to it. No doubt the words “relevance” and “relevancy” are overused and likely to show up on one of those annual lists of “Words we hope to never see again” because of it, but I refuse to give them up. Unfortunately, many consultants and service organizations must continue to find new ways to reshuffle a well-worn deck so their ideas sound new and unique and hip. Let’s not be so hasty about tossing out the need for relevancy. Assume it no longer provides value (as Jamie suggests) and rid yourself of it at your own risk. Here’s how I know: now that I’m personally footing the bill for my professional memberships, trade magazine subscriptions, Webinar and conference registration fees, travel costs, etc…. (and I consult on a 100% pro bono basis, at least for now)… I have to be very judicious about where I choose to place my dollars. Relevancy drives the level of value for me as I make those decisions: what will I get from this membership or that subscription? What might I learn from this Webinar or gain from that conference? How does it relate to ME? Yes, it boils down to that: what’s in it for me? For my members? Clients? Fellow staff members? How relevant is it to what we need, right now? But read between the lines and you’ll see that what these bloggers are saying isn’t really much different than my point here. Maddie Grant, in her post, “Merely Staying Relevant = an Innovation Killer” says that we need to be more than relevant. I couldn’t stop when I recognized that math was more relevant to the comp student than English grammar. I had to be innovative and figure out how to make it work for him. Who says relevancy and innovation are mutually exclusive? It seems to me you need one to have the other; otherwise, what value does innovation have without relevancy? If you need a real answer to that question, check out the Landfill Prize for lists of inventions that have little purpose or relevancy. Relevancy or innovation? It’s a false choice. We can — and should — have both.